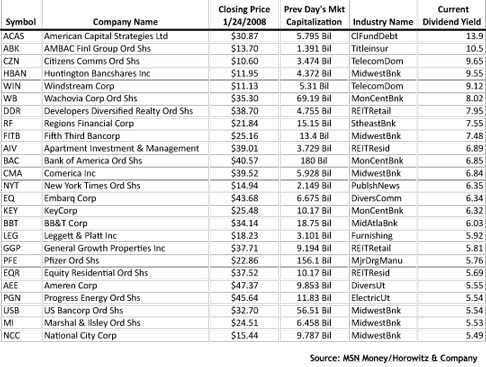 A simple list of the top 25 highest yield stocks from the S&P 500. It is a good time to look for deep value and many of the names produced by these types of screens will provide just that. Be careful not to fall into the trap of chasing yield as that is a sure-fire way of losing hard earned capital. Look at the list as a starting point for more research. Finally, with the markets showing great headwinds in front of it, many of the names toward the top of the list may need to be reviewed from a debt and capital standpoint. Make sure the none of these are overburdened with debt as it could become a problem for the dividend into the future. Disclosure: Horowitz & Company clients may have positions in stocks mentioned in this article.